Cold enough to give an icicle frost-bite. It’s spring! It’s spring! It’s spring! Tra-la-la-la-la! 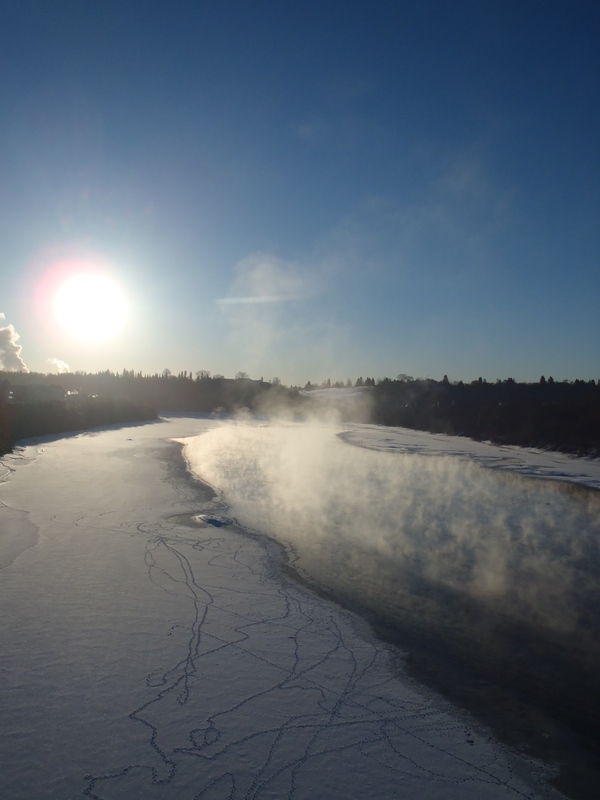 Yes, spring temperatures have finally arrived in Edmonton after almost two weeks of January type weather stretching through the end of February and the beginning of March. I’m talking about lows of -29°C with a dollop of windchill on top, as Old Man Winter’s way of saying he’s not about to shuffle off quietly. I have to admit to feeling somewhat trapped and claustrophobic going into the last week of February with the weather forecast showing an unremitting deep freeze. 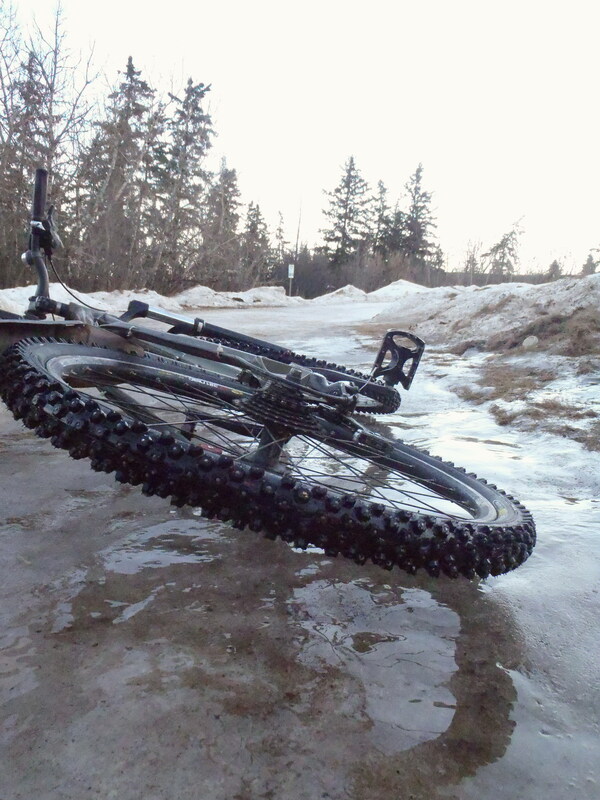 Getting through the final freeze of the season is like slowly pedaling up a steep hill, while pulling a trailer filled with bricks, on a bike with under-inflated tires and with the brake pads rubbing on the rim. It takes me three times longer to layer up and get out the door. Furthermore, the commute is a slower one with added effort of moving my heaviest boots in circles, as well as the drag caused by the grease freezing in bike components. 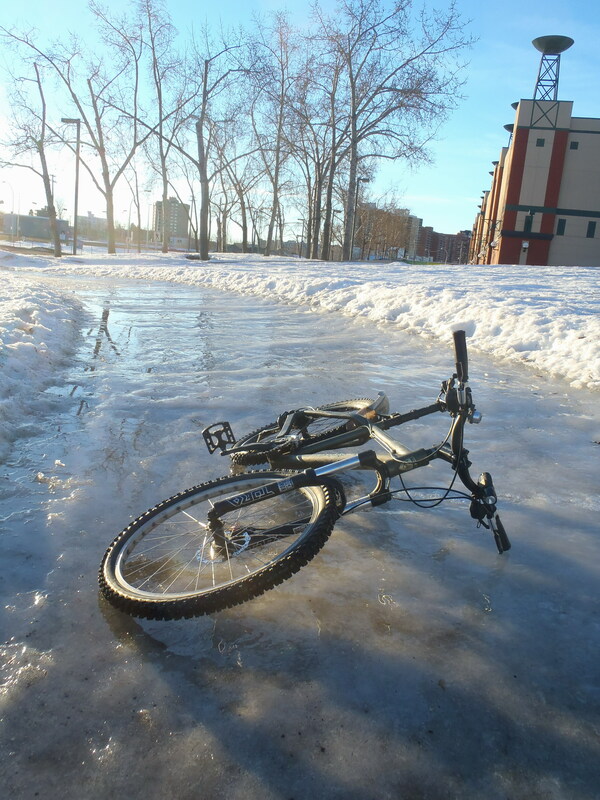 However, with a few years of Edmonton winter bike commuting under my belt, cycling through the deep cold has become just another routine. Properly prepared the riding can be comfortable and rewarding. In very cold weather, all the city buildings are sending out great plumes of condensing water vapour, as the moisture laden exhaust air from the hard-working heating systems mingles with the icy, bone dry air outside. The city looks like it’s on fire. It doesn’t often snow when it’s very cold. There was a lot of brilliantly blue sky to be enjoyed. When it did snow, it was flurries of beautiful dry powder. A real visual treat that you can sometimes spot during the deep cold are halos around the sun. 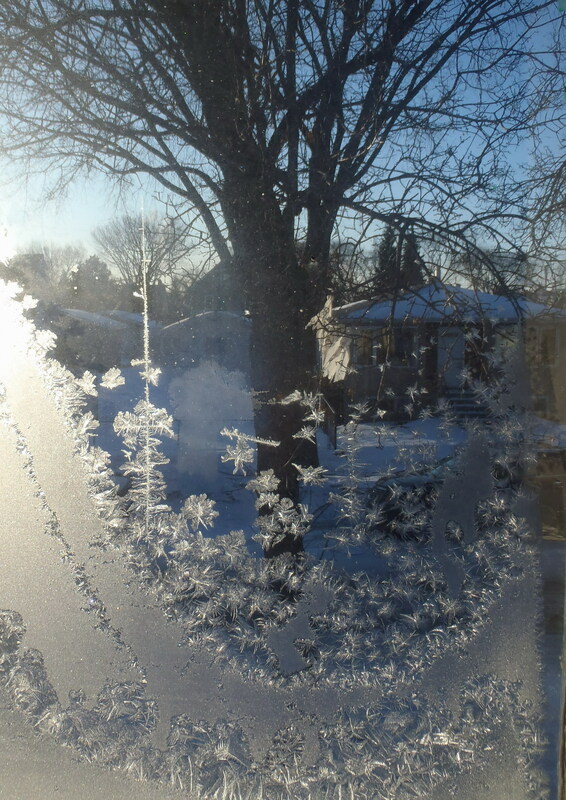 These are caused as sunlight is reflected and refracted in tiny hexagonal ice crystals suspended in the air. On one of my morning rides there was a faint haze of diamond dust crystals like a low-lying fog over the city. With the sun just over the horizon, a partial halo appeared in the form of two red and blue pillars flanking the sun. As I rode through Mill Creek ravine, an arc of halo seemed to spring directly up from the trees on the other side of the creek. It was like seeing the end of the rainbow. 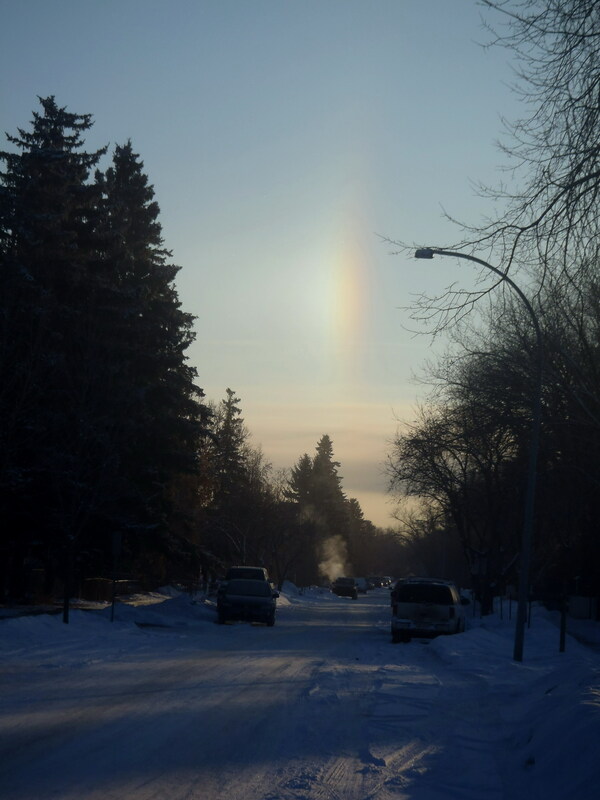 When I climbed back up to street level, depending on the conditions of light and shadow, the halo fragments sometimes seemed to be just a few feet away, but at other times to be as distant as the sun. Simply magical. Inevitably, my camera does not do it justice. The coldest weather is hopefully now behind us, I’m looking forward to melting snow, bare asphalt and eventually speedy road bikes. With luck, I’ve donned my winter space suit for the last time this winter. 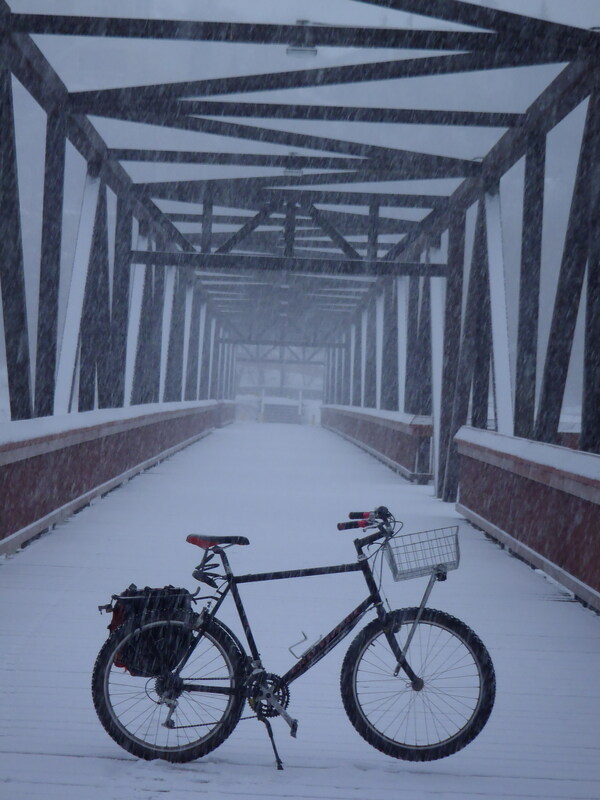 Winter bike commuting can be a very fine thing. 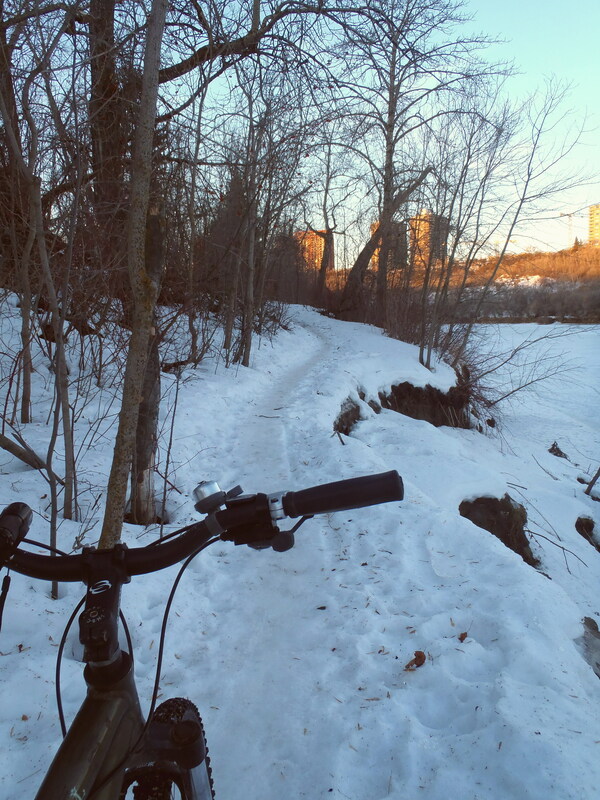 If you were to head down to Mill Creek and conceal yourself in a snowdrift, and patiently wait, peaking out with a periscope, you just might spot me happily cycling past while whistling a jaunty tune or singing a song. On the other hand, you might not want to do that as the warble of this winter cyclist is often off-key. Despite the pleasures of commuting, it’s nice to actually get out for a purely recreational ride sometimes. On Saturday morning I finally managed to do this for this for the first time in a month. The weather forecast had showed that Saturday was likely going to be the last of day of our two week long unseasonable thaw. We’ve had temperatures as high as +8°C when the normal temperature range for this time of year is between -18°C and -8°C. Knowing this gave me the necessary motivation to set my alarm for early Saturday morning. More importantly, it gave me the motivation to not press the snooze button a dozen times, ultimately ignoring the alarm, sleeping in and then annoying everyone around me by bemoaning the missed cycling opportunity. 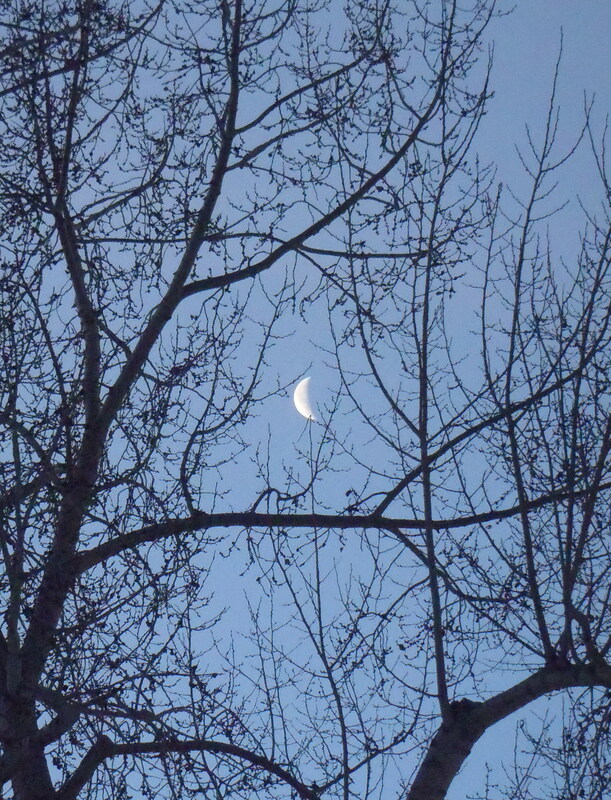 Shortly before dawn, I was out on the ravine bike and happily zooming down Kinnaird Ravine. 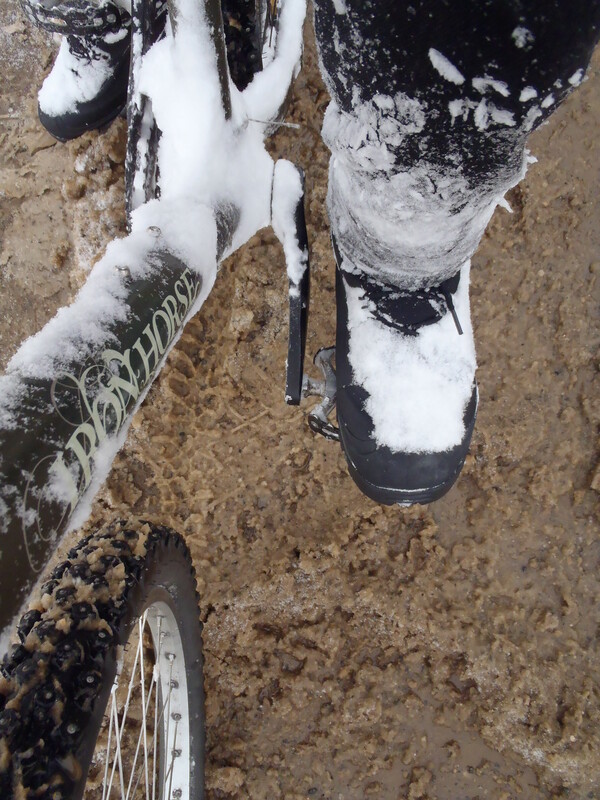 The thaw-freeze cycle has added a slick, icy crust to the boot-tromped, hard-packed snow on the trail. It’s probably treacherous to walk on, but it didn’t bother me much as I did my very best to let the studded tires do all the work. I did travel a bit slower than I normally would. 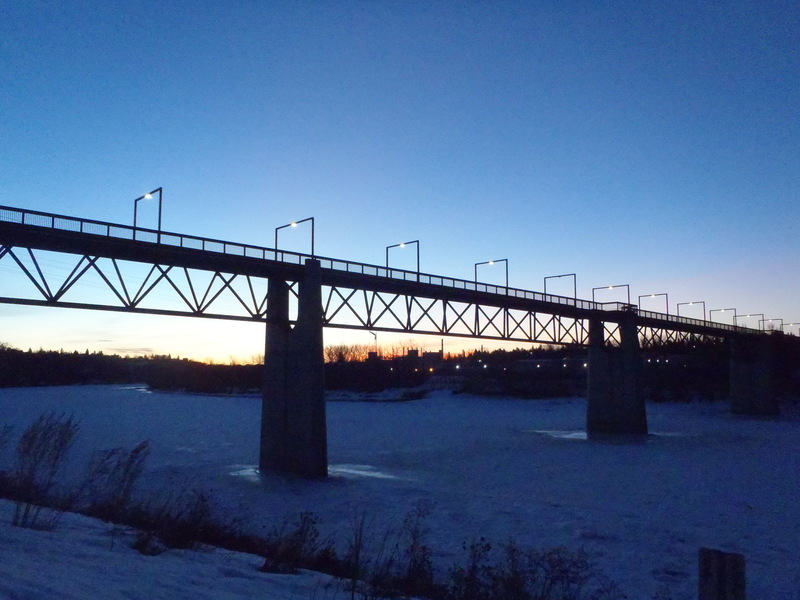 I headed along the north side of the river towards the Capilano pedestrian bridge. As I approached the bridge, I could hear some coyotes yipping somewhere ahead. 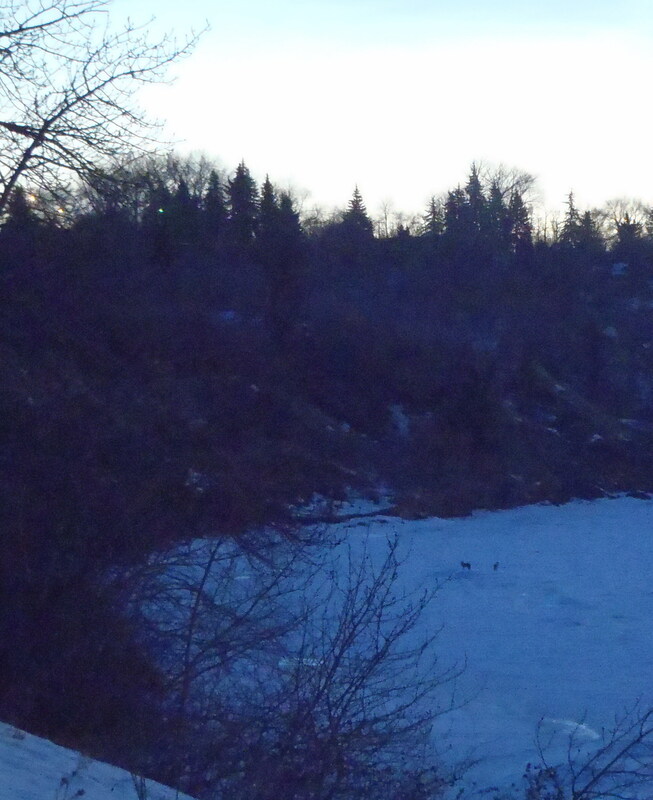 Peering down the river, I thought I could see some shapes moving about on the ice. I rushed onward to get a better view. From the bridge I could see two coyotes scampering around on the river, chasing each other playfully. This was the high point of the ride, and I stopped to watch for a good 15 minutes, breaking out the thermos of tea as well. I tried to take a picture of the animals, but they were a fair distance away, and my rugged little point-and-shoot camera has wretched zoom ability. Yes, those little black dots on the ice are coyotes. With effort, you can almost make out that they have legs. National geographic photography awards, here I come! 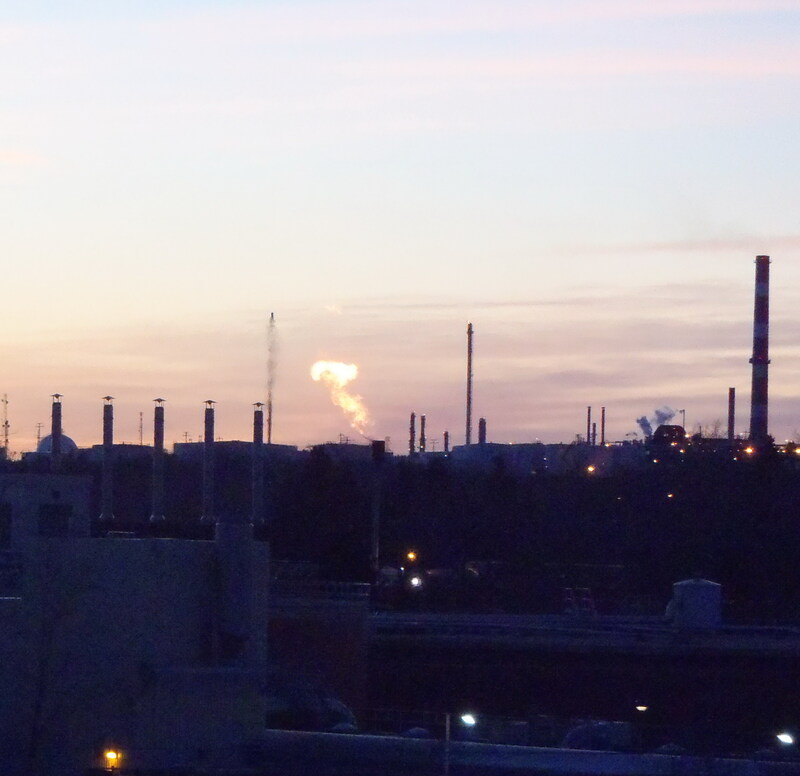 Also visible from the bridge, and equally majestic, was the Goldbar wastewater treatment facility that looked to be flaring off an excess of methane. Ah, the poetry of urban life! On the South side of the bridge, I headed back upstream and into some trails with a bit more climbing. There were a few comic moments along this segment. At a couple of spots I spun out and stalled out on a steep, icy climb and had to put my feet down…but it was too icy to walk or even stand easily. In the past I have been reduced to crawling to the side of the trail dragging my bike along. Today I was close enough to the crests to stand and lock the breaks, then use the bike as an anchor, shuffle ahead a few inches, then gingerly slide the bike ahead and repeat the process. Sheer cycling elegance, that’s my style. 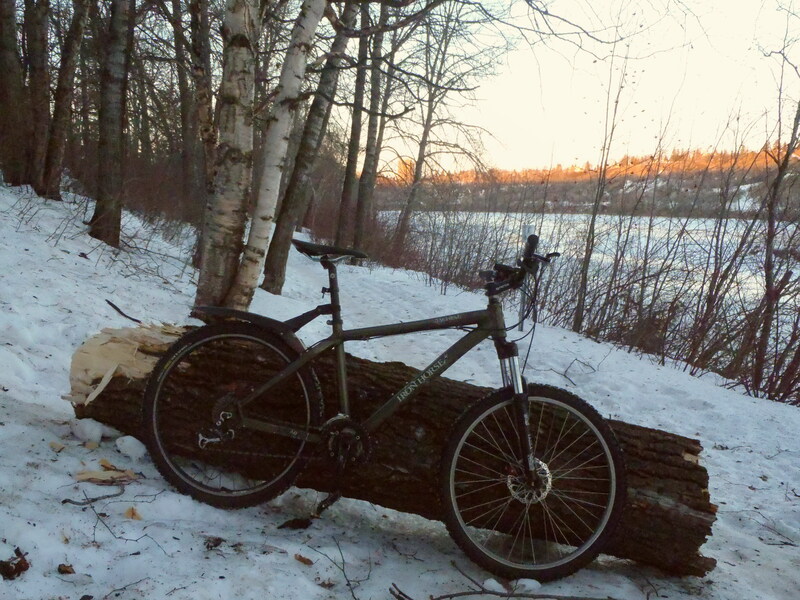 Down in the riverside trails there was plenty of evidence of our recent unusually windy day. I will forgo my usual sneering at what Edmontonians think qualifies as a windstorm, and admit that it actually was pretty gusty that day. Hmmm…should I bunny hop this obstacle, shoulder my bike cyclocross-style and hurdle it, or just heroically slink around it. As I was rolling along the path below the golf course, I startled a flock of little songbirds that flew up into the branches of a decrepit old tree and then started crying out a storm of protest at my intrusion. Suddenly suffering from an attack of a sort of digitally induced neo-pavlovian conditioning, I emulated a certain Langholm blogger and got out my camera and attempted to take a photo of the little birds. It turns out that this was actually really difficult to accomplish; the little creatures were in constant motion and my camera is at its worst in low light conditions. 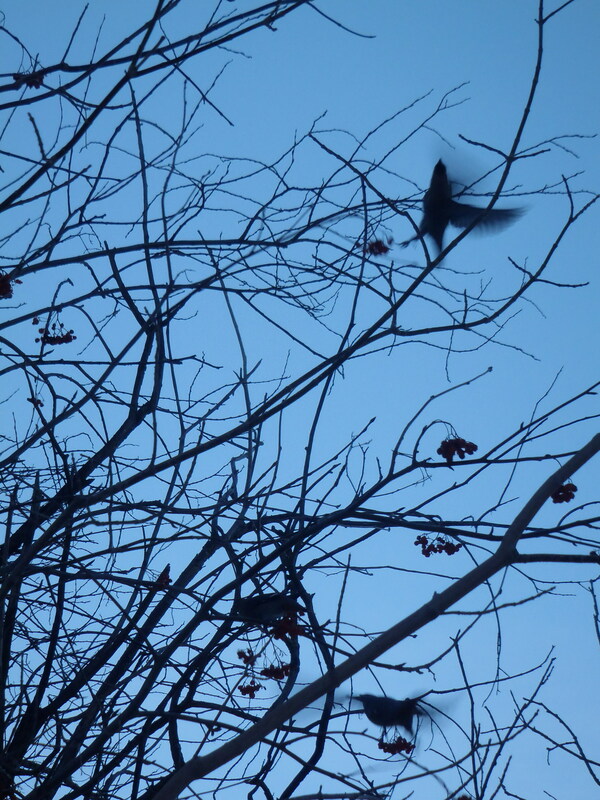 Once they decided I wasn’t some sort of bird-eating Sasquatch, they returned to feasting on the frost-wizened berries on the little stand of rowan trees. I found their choice of food to be a dubious one. The local rowan, or American mountain ash is, I think, the same species of tree that we call dogberry back on the east coast. Folks back there make a country wine using these berries. I’ve never yet had a drink of the stuff that I would describe as pleasant, though it certainly “does the job”. After this, little of note happened during the ride (other than, ya know, exuberant enjoyment of the beautiful river valley trails and warm weather). I eventually headed back up out of the valley to city street level and headed off to Bikeworks to squeeze in some time at the shop before my family was up and about. 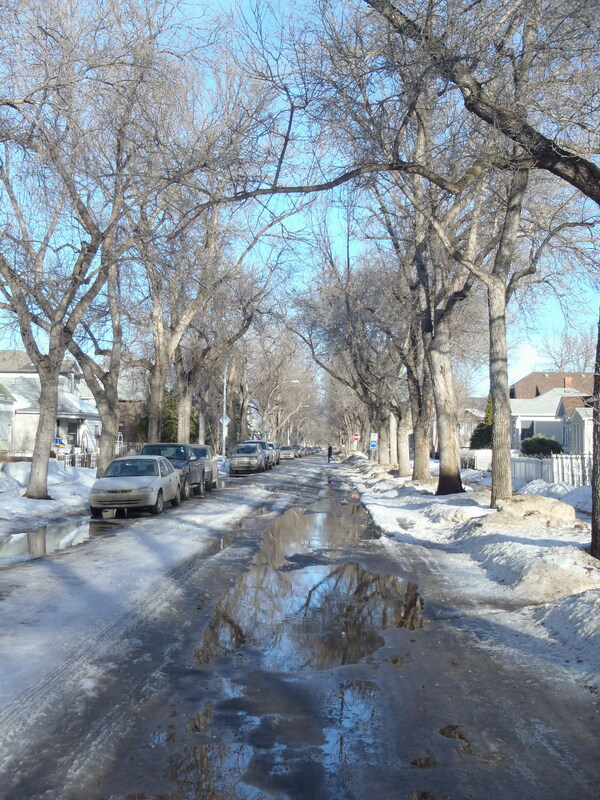 The streets were a swampy slurry of water and slush covering lunar ridges of ice. Perfect conditions for creating roadway chaos when the temperature drops. Twenty-four hours after taking this picture the temperature had plummeted from +6°C to -16°C. This year November was a wintry month: from the early snowfall at the beginning of the month, to the subsequent sheets of ice, to the later heavy snowfalls. 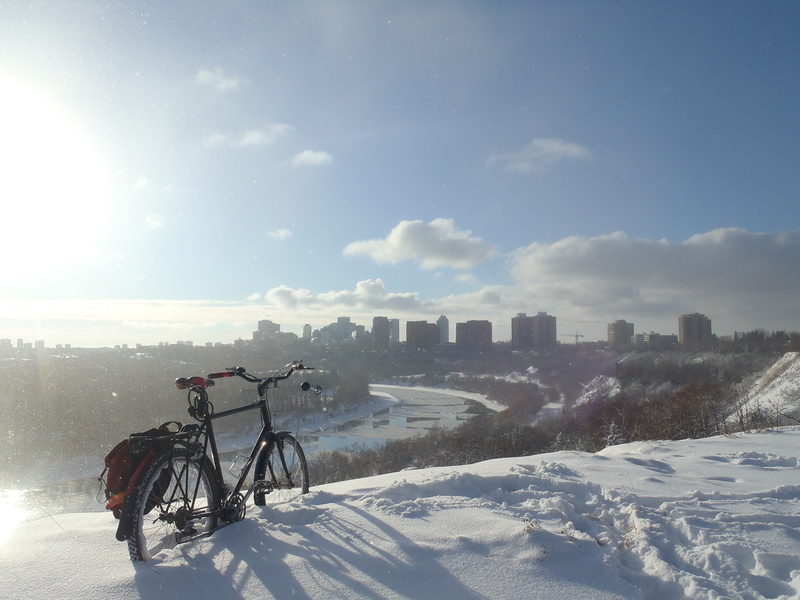 The river valley was blanketed with a heavy layer of beautiful, sparkling powder and there was some truly wonderful winter bike commuting. 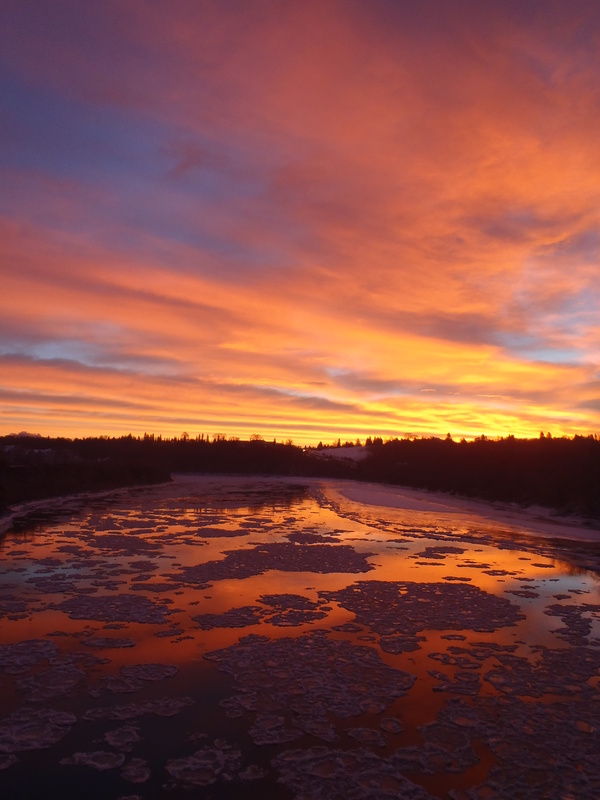 For a brief, but glorious time my trips to and from work coincided with stunning sunrises and sunsets. I was late for work two mornings in a row to due gawking at the sunrise. There was also a cold snap that lasted nearly a week with morning commuting temperatures as low as -24°C. That felt a bit unfair so early in the winter. I have lodged a formal complaint with the authorities. 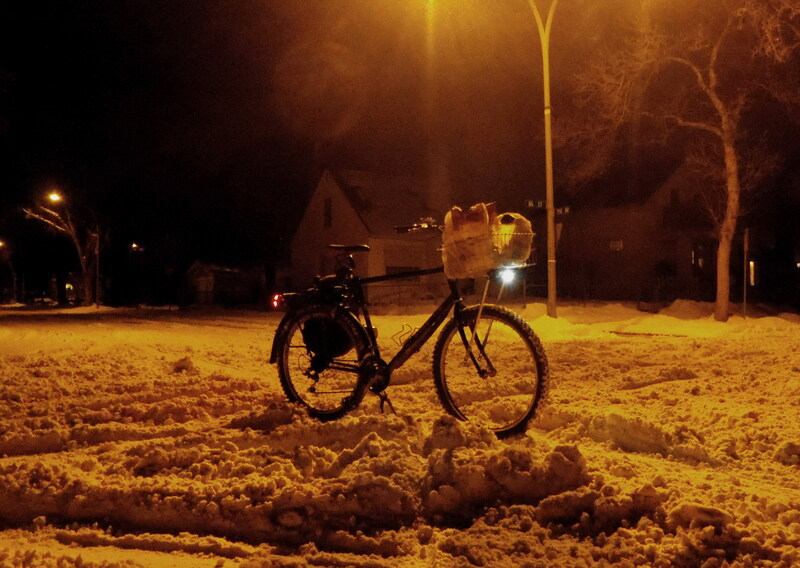 The cold snap did allow the snow on the roads to be packed down into a hard surface resulting in easy cycling. Unfortunately, the following week the temperature was near or above the freezing point most days, causing all that lovely hardpack to loosen up into a deep morass of brownish, oatmeal-like snow. It stubbornly refused to repack, resulting in a weary week of paddle-wheeling my way to work. That kind of riding is actually pretty fun in small doses. A full week’s worth, on the other hand…not so much. The city crews had their hands full with the snow clearing. In one week alone we had more snow come down than we usually average for the entire month. Main roads were cleared only to be promptly buried again. The side roads mostly had to wait. Of course, a lot of my commute is on side roads. 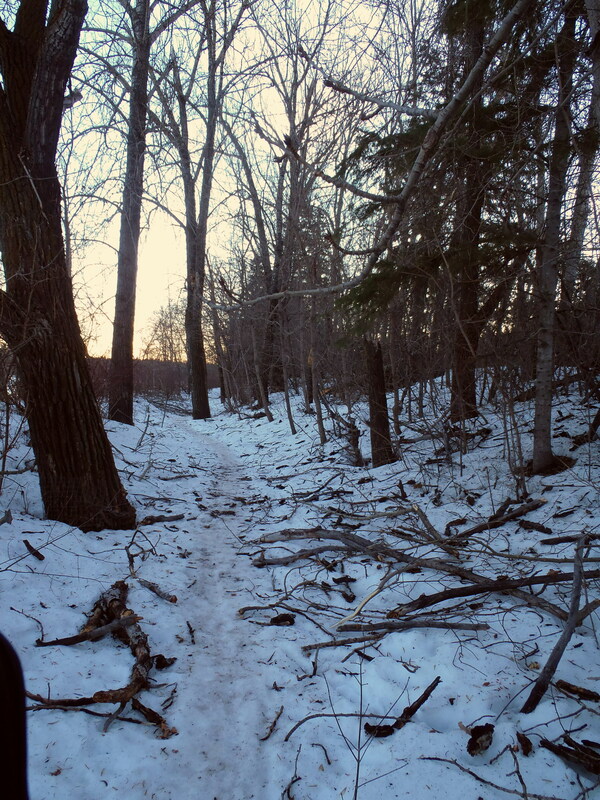 On the bright side, the multi-use trails were very promptly and consistently cleared. I was very happy to see this notice on Thursday night. 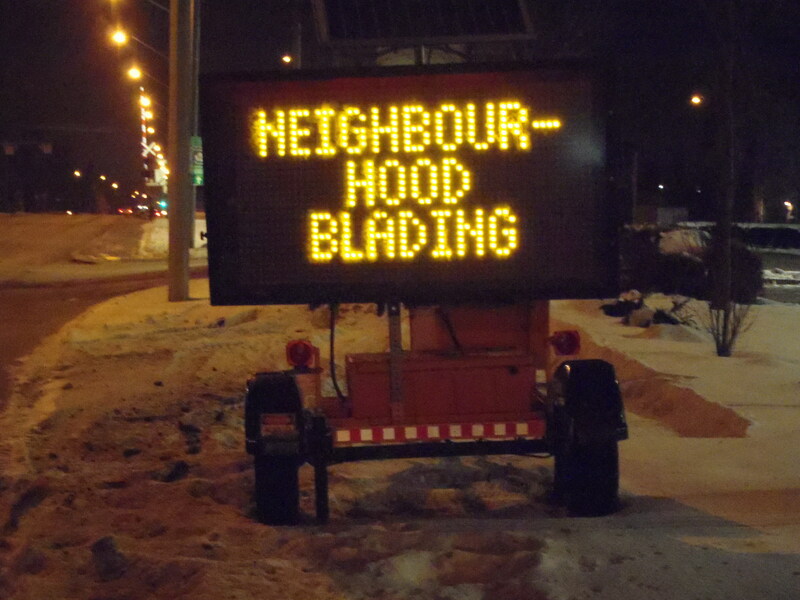 It refers to snow-clearing rather than something more sinister. My neighbourhood streets have now been well cleared of snow, just in time for the major snowstorm expected to hit tonight. Wheeeee! 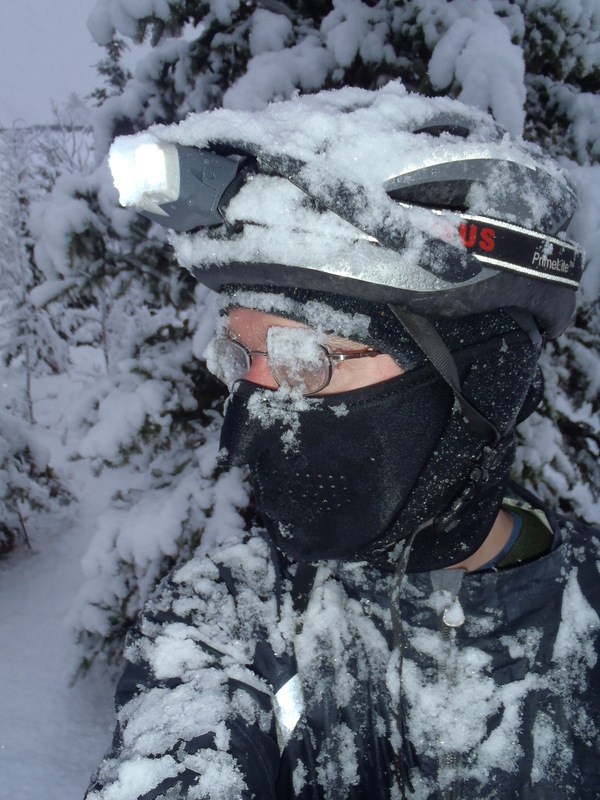 The winter conditions wore me down a bit in November, and I spent very little time reading blogs and almost none writing them. In December I hope to be a bit more active. 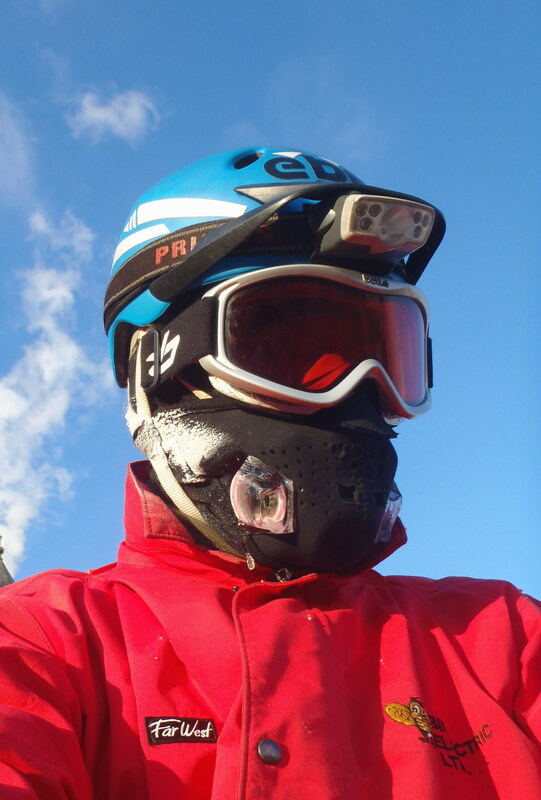 Also, as a new feature, there will be a series of guest blogs by Edmonton winter cycling vetran and EBC stalwart, Robert Clinton.